Pebre is a chilean sauce, much like Argentinean chimichurri, And like its counterpart, there are many different ways to make it. I believe the original called for just cilantro, but I liked the idea of both cilantro and parsely. Many recipes and photos that I saw had tomatoes (which then, according to Wikipedia, would make it Chanco en Piedra - not to be confused with the Chilean Funk-Rock band) and looked more like a salsa, but I decided to stick to the idea of the pebre. As usual, I looked at several online recipes and then went with what felt right. Many recipes called for 1/4 cup of water, which in my opinion would have made it much too thin and watery. Turns out I was right. This was just the right consistency without the water. 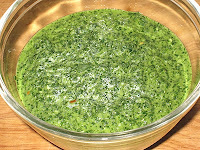 It looks a lot like my chimichurri, but I suppose that is not too surprising, since they are so similar. Like chimichurri, pebre's main use is on the grill, with steaks or chicken. 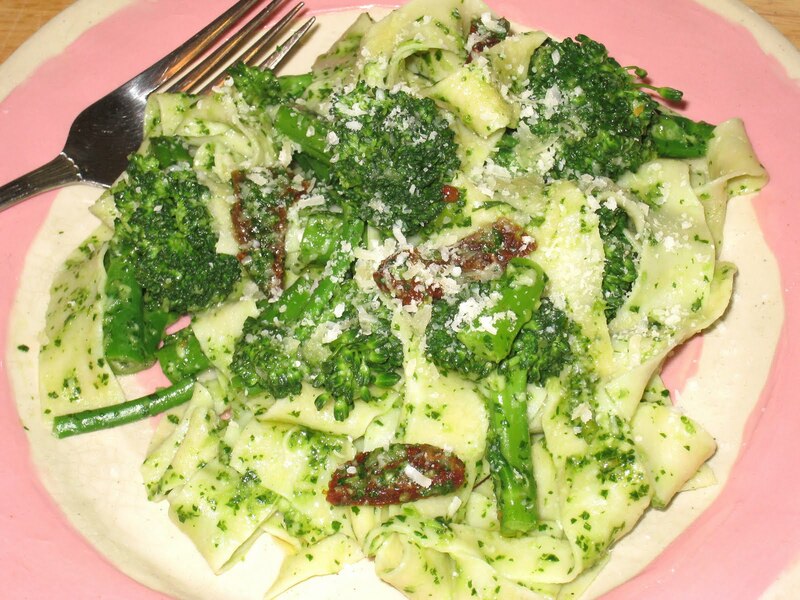 But I wanted to make pasta and I was pretty sure it would turn out something like pesto, so I made a batch of pasta and added the pebre and some blanched broccolette that was on sale at Whole Foods. And it was good. Not spectacular, but good. 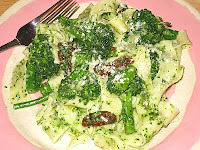 Maybe there was too much green on the plate, even with the sun-dried tomatoes I added both for color and flavor. The sauce was a little too subtle to make its presence known through the stronger vegetables on the plate. Not great, like I said, but good. But I needed to find something that would highlight the more delicate flavors. I had only used about a third of the sauce with the pasta. I haven't made pizza since I got back from Texas, so that seemed like the next thing to do. 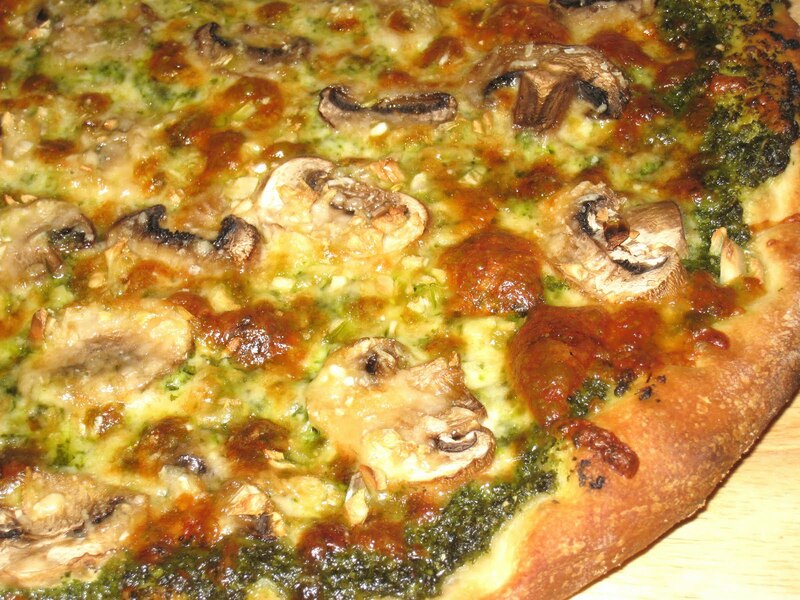 My sister, who was obsessed with all things pesto and experimented with several variations of it, once made me a pesto pizza that was quite good. So I decided to use the remaining pebre on pizza. I bought some mushrooms (half button and half crimini) at the store and used them with the pebre for the first ball of dough, and it was quite good. I spread the sauce around the dough, then added the mozzarella, the sliced mushrooms, and then the minced garlic, and finally topped it all with Parmigiana Reggiano. It came out of the oven golden and bubbling and delicious. 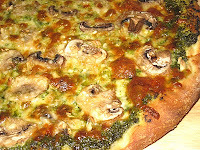 So delicious I was sorry that I had used all of the mushrooms for that first pizza. What to do for the second? I thinly sliced two plum tomatoes lengthwise and layered them over the cheese instead of the mushrooms. The result, pictured above, was superb. I think I liked it a little bit more than the mushroom version, although it is really too close to call. I can only imagine what it will be like next time, when I use both. *Dough can be made ahead and kept in the refrigerator for 2-3 days. You can also make the pizzas separately, at different times. **Can be made in advance. you did not make it ahead. Move a rack to the bottom slot of the oven and preheat the oven to 475 deg. F.
Sprinkle cornmeal around the bottom of a pizza dish. Using your hands, spread the dough around the dish, allowing for a slightly raised edge. Spread half of the pebre sauce over the dough, then half of the shredded Mozzarella cheese. Layer half of the tomato slices over the cheese, then sprinkle half of the garlic over the toamatoes. Season with salt and pepper. Drizzle about 1 teaspoon of olive oil over the tomatoes and garlic. Sprinkle half of the Parmigiano Reggiano over the pizza. Place the pizza on the bottom rack and cook to for 18 to 20 minutes, until the cheese is bubbling and the crust is golden brown. 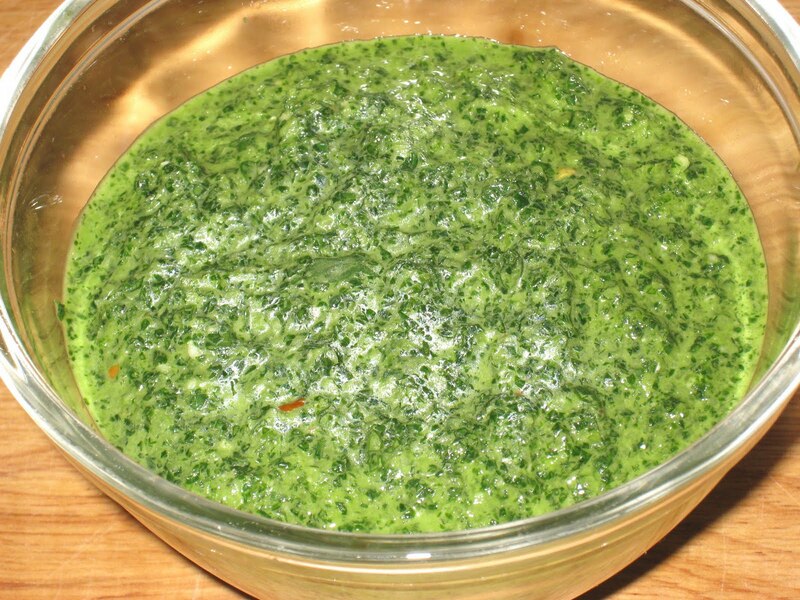 Combine everything but the oil in the bowl of a food processor. Pulse until smooth, then slowly add the olive oil. Let sit at least one hour before serving. Can be refrigerated up to one week. 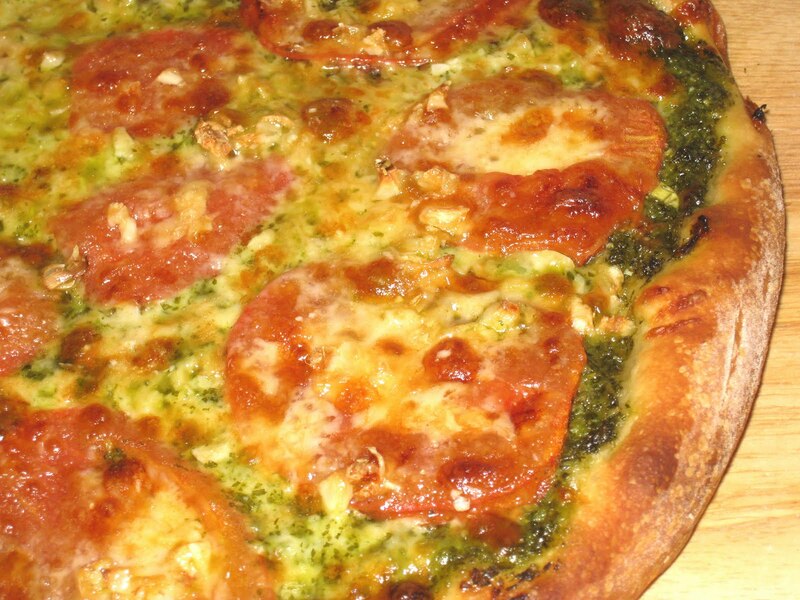 adapted from several online recipes.